Fall equals pumpkins and pumpkins equal Fall! Pumpkin spice and all things nice…Is this how you feel about Fall too? 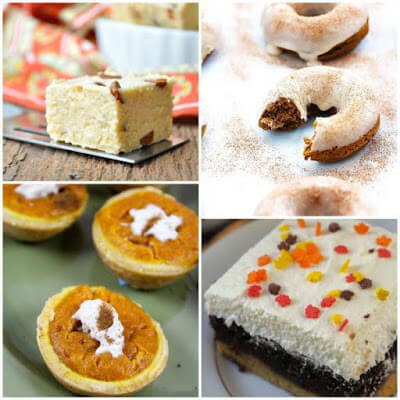 I have found 25 + Yummy Pumpkin Recipes you can make with the kids this Fall. 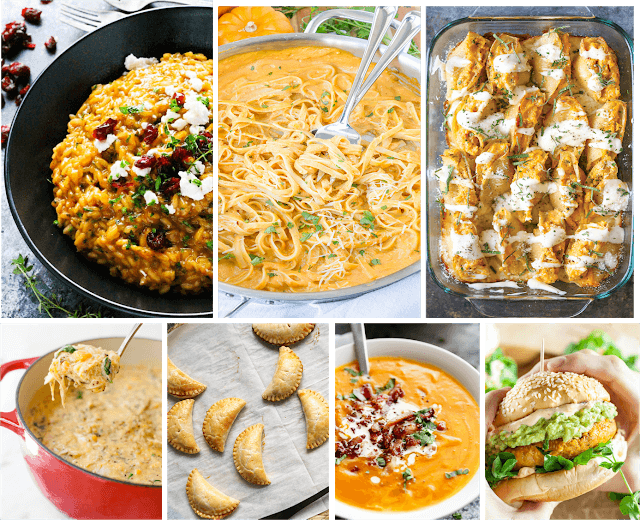 Looking for some Yummy Pumpkin Recipes to fill your October menu? You are going to love these seasonal favorites! Start with Homemade pumpkin purée, the base of almost all homemade pumpkin recipes. Then, choose a cookie recipe(or 2) and get baking! How does Pumpkin spice fudge sound? Or, Caramelized pumpkin seeds? Yummy! Don’t miss our FAVORITE Pumpkin Pie Recipe that turns out absolutely perfect every, single time! Or if you prefer… try these Mini pumpkin pies . Breakfast is sorted throughout Fall with Pumpkin spice scones, Pancakes , French toast sticks or Donuts ! We know it’s fall in our house when we start making these amazing, Easy to Make Pumpkin Waffles! Pumpkin and Oats muffins are perfect for breakfast, snacks, or school lunch boxes. On the tea time menu: Pumpkin and Nutmeg Tarts, or Three Layer Cake will go down a treat! Trying to eat more healthy foods? These are still delicious without the added calories: Low carb pumpkin bread or Low carb pumpkin pie cupcakes for a guilty free snack. Or perhaps you, or a family member, have specific dietary needs? 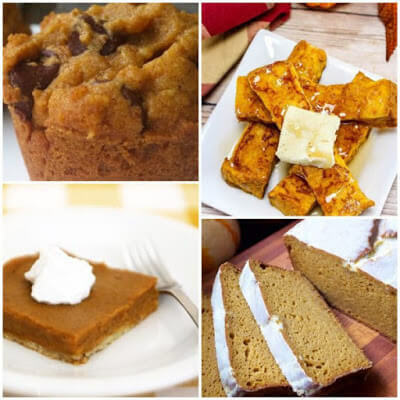 Try this Gluten free pumpkin loaf or Vegan pie squares. 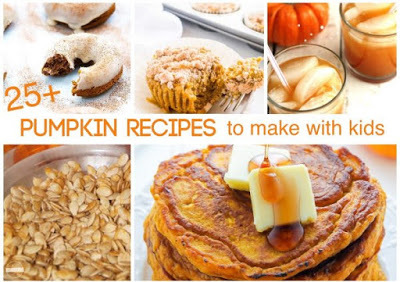 Looking for a yummy pumpkin dinner recipe? Our all time favorite is our Turkey Pumpkin White Chili – it is a family favorite we love to take to potlucks this time of year. You will also love these sweet and savory Pumpkin Pastries or Pumpkin Stuffed Shells. Looking for something else? Why not this Pumpkin Risotto with Goat Cheese or Pumpkin Alfredo. Of if you are looking for a fall soup, try this Thick and Creamy Pumpkin Soup or Chicken Pumpkin Quinoa Chowder. If you are looking for a healthy pumpkin recipe you’ll want to take a peak at these Chipotle Pumpkin Veggie Burgers. Lastly, for drinks, make a Smoothie or Thanksgiving punch with apple and pumpkin spice( perfect for gatherings). The kids will definitely love this Harry Potter pumpkin juice! But my favorite may just be this Slow Cooker Pumpkin White Chocolate Recipe! YUMMY! 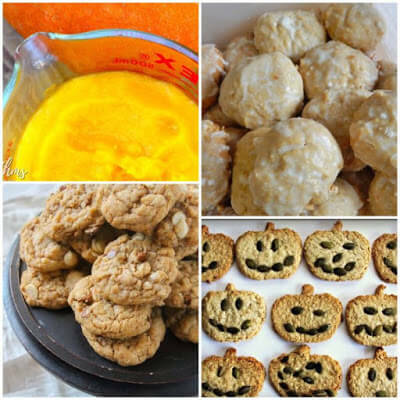 So many perfectly pumpkin recipes to make with the kids and make memories too! Which will you try first?